The front and back are separating from each other on this flimsy, deteriorating postcard, so its days are surely more numbered than the others in my collection. 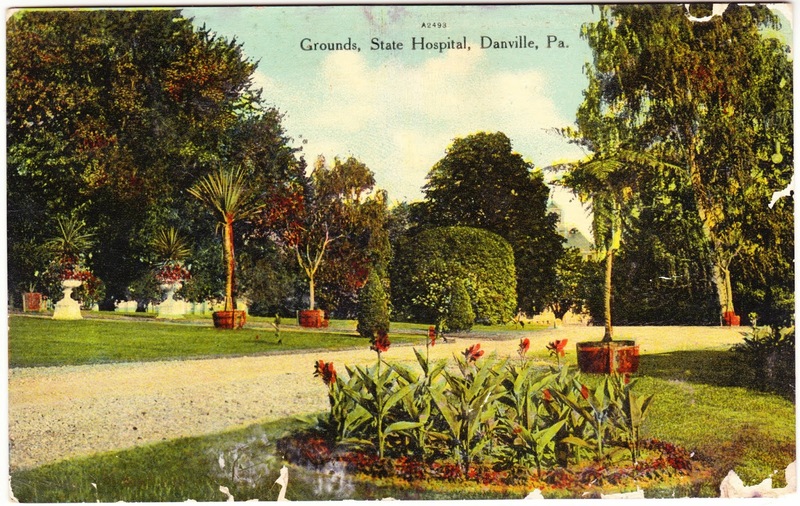 Featured on the front are the grounds of the state hospital in Danville, Pennsylvania. Located near the North Branch of the Susquehanna River, it opened in 1872 as the State Hospital for the Insane at Danville. It's still in operation today, as simply the Danville State Hospital, and it helps "individuals who have severe mental illness and substance abuse issues." The hospital, designed under the Kirkbride Plan, is the oldest psychiatric facility still in operation in Pennsylvania and is on a short list of Kirkbride facilities nationwide still being used for their original purpose. For more information about Danville, this website provide photos and a deeper history for researchers. I have no apologies to make for not writing & answering the cards you sent me. I thank you very much for them, if I wrote to you every time I thought about writing I think you would have gotten tired reading my letters. I am very sorry I did not write to you. Hope you are well, hope your folks are well. Remember us to them. Love for yourself. 1. Georgia Klinefelter has appeared many times on Papergreat. Start learning more about her in this 2016 post and this 2014 post.